Timely diagnostics of destructive forms of acute pancreatitis as one of actual problems of urgent surgery is covered in given research. The increase of pancreatonecrosis revealing efficiency by means of modern NLS-technologies complex has served the purpose of our research. 237 acute pancreatitis patients were examined: edematic form of disease was registered in 141 (59,5 %) patients, hemorrhagic pancreatonecrosis was registered in 54 (22,8 %) patients, fatty pancreatonecrosis in 30 (12,6 %) and purulent-necrotizing pancreatitis in 12 (5,1 %) patients. Unique characteristics for each form of disease revealed at NLS are described. Methodological principles of NLS-examination of patients with suspicion to destructive forms of acute pancreatitis are shown. 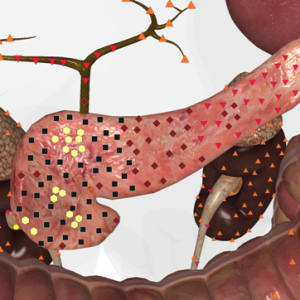 High efficiency of NLS-graphy in revealing of acute pancreatitis and its forms is demonstrated. Acute pancreatitis is one of the basic problems of modern urgent surgery which is proved by steady growth of disease and high lethality rates. The important factors defining this circumstance are: late or error diagnosis, underestimation of condition severity of patients and, correspondingly, an inadequate choice of necessary conservative and surgical measures. Principles of surgical treatment of pancreatonecrosis patients are based on the differentiated approach to the choice of operative measures depending on development phase of disease, its clinical-morphological form, severity level of patient’s condition and disease terms. Various degree of pancreatic gland necrotic affection spread and different parts of extraperitoneal cellular tissue, and also the fact of their infection define the choices variety of surgical approaches. One of the most difficult and problem issues is the issue of acute pancreatitis classification. In 1992 at International symposium concerning acute pancreatitis in Atlanta (USA) the classification based on differentiation of intrabelly and system complications of acute pancreatitis taking into account of development features of inflammatory and destructive processes, and also disease severity levels has been recommended for clinical use as a result of agreement of 40 leading surgeons-pancreatologists from 15 countries of the world. Acute pancreatitis was defined as an acute inflammatory process in pancreatic gland with variable involving of other regional tissues or distant systems and organs. 2. Acute congestion of a liquid (in pancreatic gland tissue and in pancreatic cellular tissue). According to a number of authors this classification has many disadvantages and various readings. In given research we have divided acute pancreatitis for edematic and destructive for greater effectiveness of material analysis. Destructive pancreatitis according to Savelev V.S. classification (1989) has the following forms: haemorrhagic, fatty and purulo-necrotic. Purulo-necrotic complications is the principal lethality cause in case of destructive pancreatitis. Lethality rate at purulo-necrotic complications of acute pancreatitis is 85 %. At present time NLS-method takes significant importance in diagnostics of pyoinflammatory diseases of pancreatic gland which allows estimating condition of pancreatic gland in dynamics. Identification of acute pancreatitis form is extremely important because correct information on patient’s condition gives the chance to try to interrupt a pathological chain of disease development by application of the most effective treatment methods at the given form of disease of the patient. The purpose of our work was studying of use efficiency of modern NLS-methods in diagnostics of destructive forms of acute pancreatitis. 1. Obligatory (minimum) standard two-dimensional NLS. 2. Expanded (recommended) NLS, providing specifying diagnostics of degree of expressiveness of inflammatory process. In these cases 3D NLS-ultramicroscanning with spectral-entropy analysis (SEA) was used, allowing discussion on their genesis and character of pancreatic gland pathology. Edematic form of acute pancreatitis was diagnosed in 141 (59,5 %) patients, haemorrhagic pancreatonecrosis was diagnosed in 54 (22,8 %) patients, fatty pancreatonecrosis in 30 (12,6 %) patients and purulo-necrotic pancreatitis in 12 (5,1 %) patients. Edematic form of chronic pancreatitis lasts within 3–4 days and it does not demand special treatment usually. Direct NLS-graphic signs of edematic form of acute pancreatitis registered in all patients. Affection of the whole gland was registered in 27 % of patients, the head was affected only in 35,6 % of patients, in 9,3 % only body and in 11 % only tail of pancreatic gland was affected. In rest of 17,1 % of patients the combined affection of head and body or tail and body was marked. Gland head was affected for 18,4–61,2 %, body for 6,8–41,4 % and tail for 14,5–31,5 % in relation to norm that characterized the basic localization of inflammatory process. In 71 % of patients with edematic form of disease the increase of glands chromogenety (5-6 points according to Fleyndler scale) is registered. Formation of hypochromogenic areas on the background of increased chromogenecy of pancreatic gland tissues was detected during case monitoring in 24 (17,1 %) patients, 9 patients out of this number had necrotic zones. Contours of gland in majority of patients (81,3 %) were accurate, well defined from surrounding bodies and tissues. Only in 18,7 % of cases there was some illegibility of contours which corresponded to transition to exudative stage and development of peritoneal process. In cases of NLS- angiography the affection of vessels was marked. Indirect signs of edematic form were detected in 37,1 % of patients, they represented the condition of neighbouring structures and organs. Responsive changes from gastrointestinal system in the form of raised intestinal pneumatosis, stasis of contents and etc. were found in 82,4 % of patients. Omentobursitisis was diagnosed in 6,1 % of edematic pancreatitis patients. Case monitoring of omentobursitisis patients has shown that 3 patients had infiltrative stage of inflammation turned into destructive. Thus, NLS-monitoring patients condition with edematic form of acute pancreatitis has shown that additional surgical treatment was not required in 132 (93,6 %) of cases, and in 9 (6,4 %) of cases the disease has turned into destructive form. NLS-graphic picture of haemorrhagic pancreatonecrosis was diagnosed in 54 (22,8 %) of patients. It was characterized by gland affection more than 70 %. Pancreatic gland had raised chromogenecy (6 points according to Fleindler’s scale) on the background of which there were achromogenic necrotic areas of irregular shape localized both in gland itself and parapancreatic cellular tissue, in consequence of which the contours of pancreatic gland were irregular and indistinct in some spots. Exudate of abdominal cavity was marked in 92 % of patients. During NLS-angiography the affection of vessels in gland depth and on its surface was marked, no blood flow in zones necrotic dissolving was detected. Fig. 1. NLS-image of edematic pancreatitis. Structure of the gland is homogeneous, moderately hyperchromogenic. Fig. 2. NLS-image of haemorrhagic pancreatolysis. Structure of the gland is hyperchromogenic, heterogeneous. Major hypo- and achromogenic areas in pancreas head are visible. Fatty pancreatonecrosis was diagnosed in 30 (12,6 %) of acute pancreatitis patients, total pancreatonecrosis was registered in 89,1 % out of these patients, and subtotal pancreatonecrosis was registered in 10,1 %. The sizes of affection zone were increased considerably. Their increase was more than in case of haemorrhagic pancreatonecrosis for 5,6–17,2 %. The structure of gland parenchyme was heterogeneous due to the areas of raised and lowered chromogenecy, corresponding to necrosis zones. Contours of pancreatic gland were merging with dissolved parapancreatic cellular tissue and almost always were indistinct. Omentobursitisis was detected in 83% of patients and exudate in abdominal cavity was registered in all patients. During NLS- angiography the zones of vessels affection were registered in a view of necrosis sites. Purulo-necrotic pancreatitis was diagnosed in 12 (5,1 %) of patients. During NLS the substantial sizes increase of pancreatic gland affection zone (more than 80 % from normal values) was registered. Gland parenchyme was hyperchromogenic (6 points according to Fleindler’s scale), its contours indistinct and irregular. The structure was non-uniform caused by large maturated necrosis zones. Suppurative foci had rough, in some places indistinct contours with “visualization” of hypochromogenic contents caused by gas bubbles. Parapancreatitis, omentobursitis and generalized purulent peritonitis were accompanied by infected pancreatonecrosis in all surveys. Parapancreatic abscess was diagnosed in 4 cases in the form of liquid formations with thick walls and heterogenous contents in the form of suspension, partitions, hyperchromogenic structures of irregular shape. Blood flow research in case of purulent pancreatitis has revealed the extensive vessels affection in necrosis zones. One of the important components of acute pancreatitis severity estimation level for definition of treatment methods is the estimation of pathological process spread. In accordance with Savelieva V.S. spread classification (1989) the destructive pancreatitis is divided into limited and widespread. As can be seen from the above, limited acute pancreatitis demands conservative and/or puncture-drainage treatment under the control of visualizing research methods; draining, and in some cases also suction operative interventions are necessary in case of extended pancreatitis. Within the limits of performed research the limited destructive pancreatitis (haemorrhagic, fatty and purulo-necrotic) was diagnosed in 31 (32,3 %) of cases, spread pancreatitis was diagnosed in 65 (67,7 %) of cases. In case of limited destructive pancreatitis the waiting surgical approach under daily NLS-monitoring was performed, at progressing of destructive process (quantity and expansion increase of necrosis zones, presence of suppurative complication) 11 (35,5 %) patients were draining operated. In case of extended pancreatitis regular NLS-monitoring of patients in 53 (81,5 %) of cases has shown the progression activity of pathological process which in 36 (67,9 %) of cases required draining operative measures, and in 17 (32,1 %) of cases it required stage sanitation of abdominal cavity and retroperitoneal space. Thus, our researches have shown that the use of NLS-techniques complex allowed revealing characteristic signs of acute pancreatitis – increase of pancreatic gland affection zone, observed in all patients; chromogenecy increase of gland parenchyme, registered in 70 % of patients with edematic form of acute pancreatitis and in all patients with destructive forms; exudate in lesser peritoneal cavity (in 6,1 % of patients with edematic form) combined with gland structure discontinuity served as unfavourable prognostic sign of pancreatonecrosis development. Application of volume reconstruction of cavitary lesions in 4 purulent pancreatitis patients with parapancreatic abscess has helped in planning of remedial measures techniques – from puncture and draining of pyoinflammatory formation (in 1 patient) to performance of expanded abdominal operations (in 3 patients). Performed NLS-monitoring in given category of patients gave the opportunity of timely detection of pathological process progressing and development of complications and also perform minimally invasive and open surgical manipulations on their elimination. At the present time there is a possibility of diagnostics and monitoring of acute pancreatitis patients condition according to the computer tomography, however not all city hospitals are equipped by computer tomographs, and also the cost of similar research is relatively high. One of the disputable issues of case monitoring is the radiation exposure of the patient. We use well-known NLS-techniques, but, unfortunately, they are very seldom used in hospitals, however due to their high diagnostic informativity we recommend their large-scale implementation into practical public health services. At data generalization of clinical use of modern NLS-techniques complex in diagnostics of destructive pancreatitis its following advantages are revealed: accuracy, informativity in estimation of inflammatory process; predictability and diagnostics of pyoinflammatory complications in early terms; possibility of timely performance of measures aimed at prevention of infected pancreatic necrosis development; simplicity and availability, allowing its application in any medical institution; non-invasiveness; quick results reception after research. Thus, the application of modern NLS-technologies in case of acute pancreatitis both considerably expands the possibilities of timely and authentic diagnostics of destructive forms of pancreatic gland acute inflammation, and also provides new opportunities for effective solution of complicated problems in revealing of purulent complications in case of such disease. 1. Savelyev V.S. Manual on urgent surgery of abdominal cavity organs. M: Triad-H, 2005. 2. Krasilnikov D.M., Abduljanov A.V., Borodin M.A. 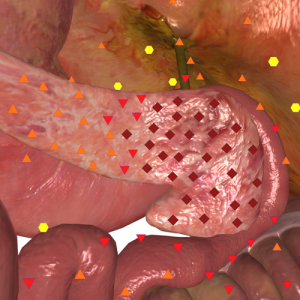 Medical-diagnostic tactics in destructive pancreatitis patients. The almanac of Institute of surgery n.a. Vishnevsky A.V. 2008; 3 (3: 113-123). 3. Bradley E.L. 3rd. A clinically based classification system for acute pancreatitis. Summary of the International Symposium on acute pancreatitis, Atlanta, GA, September 11 through 13, 1992. Arch. Surg. 1993; 128: 586–590. 4. Bagnenko S.F., Goltsov V.R. Acute pancreatitis – current state of a problem and unresolved issues. The almanac of Institute of surgery n.a. Vishnevsky A.V. 2008; 3 (3: 104-112). 5. Tolstoj A.D., Panov V.P., Krasnorogov V.B., etc. Parapancreatitis. Aetiology, patogenez, diagnostics, treatment. SPb. : Yasniy Svet, 2003. 6. Banks P.A., Freeman M.L. Practice guidelines in acute pancreatitis. Am. J. Gastroenterol. 2006; 101: 2379–2400. 7. Bagnenko S.F., Tolstoj A.D., Krasnorogov V.B., and others. Acute pancreatitis (diagnostics and treatment reports). Surgery 2005; 7: 19–23. 8. Nesterenko Yu.A., Laptev V.V., Mihajlusov S.V. Diagnostics and treatment of destructive pancreatitis. M.: BINOM-Press, 2004. 9. Gostishchev V.K. Infections in surgery: Doctor’s manual. M.: GEOTAR-Media, 2007. 10. Mitter S., Lehnhardt K., Elvins A. Three-dimensional NLS-graphy in diagnostics of pseudo-tumor-like pancreatitis //«Actual problems in NLS-diagnostics». Volume I. M.: 2013, p. 21-26.